Pastor Jackson is a native New Yorker, born and raised in Queens. He and his wife Kim have been happily married for over 18 years. Rev. 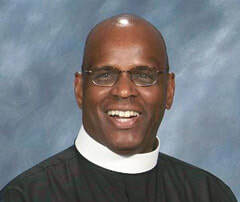 Jackson is currently the senior pastor of the St. Paul’s United Methodist Church of Vanderveer Park. Before his present ministerial assignment, Pastor Jackson served at the following churches: St. James United Methodist Church in Lynbrook, NY; First United Methodist Church of Hollis Queens, NY; First Roosevelt United Methodist Church and he served as a volunteer preacher for Sunday Services at the Far Rockaway Mission Center. As part of the process of becoming an Ordained Elder, Pastor Jackson completed supervised ministry stints at Grace United Methodist Church in Valley Stream and Wesley United Methodist Church in Franklin Square, New York. Pastor Jackson received his call to ministry while attending Springfield Gardens United Methodist Church under the Pastoral Leader of Rev. Dr. Cecil B. Stone. Pastor Jackson spent ten years serving this loving and accepting congregation as a member of the Church’ ministerial staff. Pastor Jackson is a graduate of New Brunswick Theological Seminary with a Master of Divinity. He has a Bachelor’s Degree in Organizational Management from Nyack College and an Associate Degree in Business Management from the Borough of Manhattan Community College. Out of all his accomplishments, that which is stands head and shoulders above the rest was his good sense to have one day said YES to Jesus Christ when he Called him out of a world of darkness to become a disciple of His. ​ Pastor Ama Aidoo is Ghanaian-American minister of the gospel with a strong passion to draw many to the saving knowledge of Christ Jesus. Pastor Ama is currently pursuing her Masters in Divinity degree at Drew Theological School. Pastor Ama received her call to ministry in 2013 and has been serving in the ministry since then. Ama is a passionate lover of Jesus Christ who enjoys sharing the love of Jesus Christ with all those she encounters. Ama has been blessed to serve the body of Christ in roles such as Chaplain of Youth Fellowship, Church Secretary and now a Youth Pastor. Ama strongly believes in Young People’s Ministry and as such devotes her time and resources to coach young people in how to pray, study the word, evangelize to grow and become faithful believers in Christ. She expresses that this work always bring her immense joy as she witnesses to young people to grow to trust and depend on God. Truly, God is indeed at work in her life. Ama brings with her a zeal and passion that stirs young people to desire to know God. Ama has set her heart to know and obey God and be offered fully to His service as God is her exceedingly great reward.